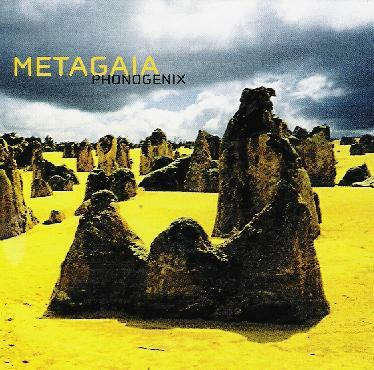 Metagaia is a solo project from Haruhiko Tsuda, who was a key member of the 70's Japanese progressive rock band Shingetsu. The tracks on Phonogenix were recorded in the late 90's and released in 2005 as joint release by the Musea and Poseidon labels. The music is based a bit too much in the New Age realm for my taste, though I must give Tsuda credit for extending the genre well beyond mere fluff. Among the highlight tracks is "Divinity Rising", which starts off as a lush and hypnotic blend of space-symphonic and New Age music. But it does eventually get into a nice grooving rhythmic pattern that is nicely paired with a droning didgeridoo, soon joined by a wailing free-jazz sax. At this point the percussion gets even more interesting and things are finally in a somewhat more adventurous meditative prog realm. "The Star of D.O.G." has really nice guitar and horn sections to add character to the New Age foundation, as well as off-kilter percussion that contrasts nicely with the fluffy meditatative bits. "A Signal Glows in the Dark" brings to mind Mark Isham, with its blend of trumpet and dreamy atmospherics. And "Water Harp" is a sort of Fripp & Eno styled interplay of guitars and ambience. Very nice music, some tracks far more interesting and adventurous than others.